Is this normal? Or symptomatic of a problem? I used a glass bowl and covered it with plastic wrap. The bowl was oiled, and I also oiled the outside of the dough. When the dough was done kneading, it was very elastic (passed window pane); it also was a bit on the wetter side, I think -- it was hard to ball it up as it didn't want to hold its shape. You can certainly try baking it, but that dough looks quite overleavened to me. You might end up with no body, bad crumb, and/or terribly sour taste. Still, at that point, baking it is a better thing than throwing it out outright - there is a good chance the result will be okayish/edible, if not great. Also, I might be wrong in my diagnosis, since I am basing it on a single picture and cannot touch and smell the dough. 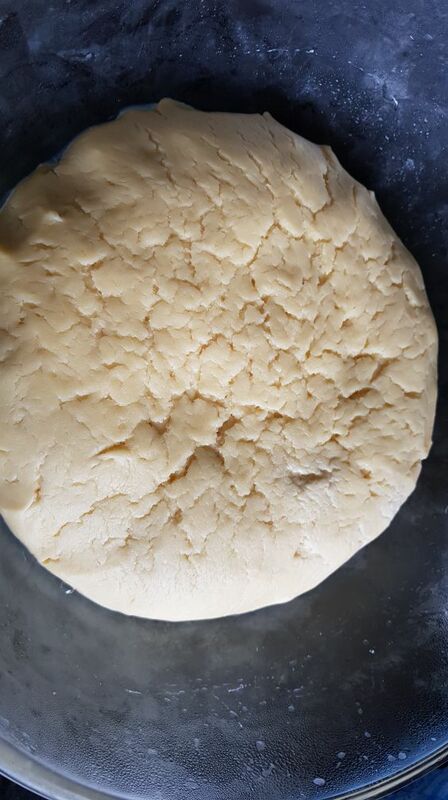 To make it clear, I am not saying "overleavened" because of the mere description of "cracks", it is that the picture looks like the dough rose a lot and then slumped. You can get cracks from other processes too, but they don't usually look like in your picture. To prevent overleavening, take care to not proof for very long times, unless the recipe was specifically designed for it. Also, never use more yeast than the recipe suggests.